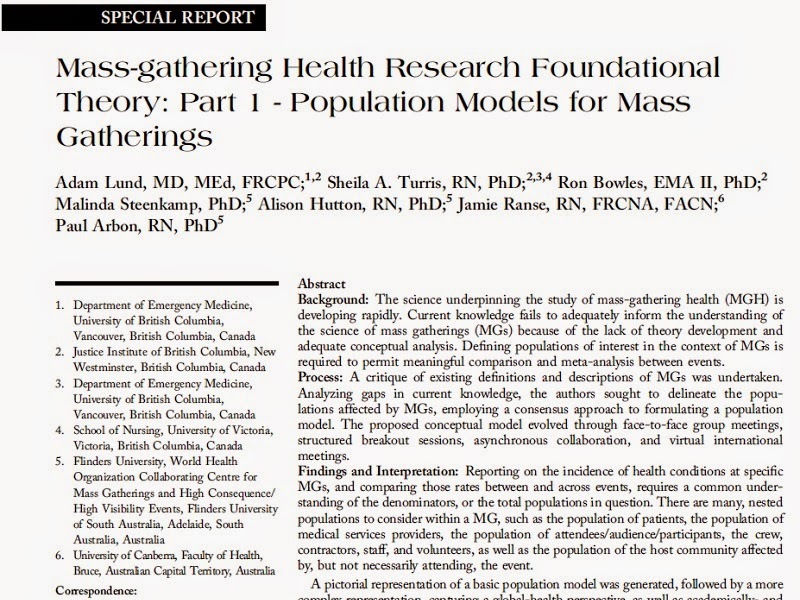 Background: The science underpinning the study of mass-gathering health (MGH) is developing rapidly. Current knowledge fails to adequately inform the understanding of the science of mass gatherings (MGs) because of the lack of theory development and adequate conceptual analysis. Defining populations of interest in the context of MGs is required to permit meaningful comparison and meta-analysis between events. Process: A critique of existing definitions and descriptions of MGs was undertaken. Analyzing gaps in current knowledge, the authors sought to delineate the populations affected by MGs, employing a consensus approach to formulating a population model. The proposed conceptual model evolved through face-to-face group meetings, structured breakout sessions, asynchronous collaboration, and virtual international meetings. Findings and Interpretation: Reporting on the incidence of health conditions at specific MGs, and comparing those rates between and across events, requires a common understanding of the denominators, or the total populations in question. There are many, nested populations to consider within a MG, such as the population of patients, the population of medical services providers, the population of attendees/audience/participants, the crew, contractors, staff, and volunteers, as well as the population of the host community affected by, but not necessarily attending, the event. A pictorial representation of a basic population model was generated, followed by a more complex representation, capturing a global-health perspective, as well as academically- and operationally-relevant divisions in MG populations. Conclusions: Consistent definitions of MG populations will support more rigorous data collection. This, in turn, will support meta-analysis and pooling of data sources internationally, creating a foundation for risk assessment as well as illness and injury prediction modeling. Ultimately, more rigorous data collection will support methodology for evaluating health promotion, harm reduction, and clinical-response interventions at MGs. Delineating MG populations progresses the current body of knowledge of MGs and informs the understanding of the full scope of their health effects.